Oyakodon, literally translates into 'parent-child-rice bowl dish' is an example of simple Japanese home cooking. It is so named due to the presence of the chicken (parent) and egg (child). This is an ultimate comfort food that takes no time to prepare at all. The chicken and onion are first cooked in a sweet savoury broth and then top with beaten eggs. The whole dish is then remove from the heat just as the eggs are beginning to set so you get this soft creamy eggs that surround the tender and flavoursome chicken. The whole dish is served on top of a bowl of freshly steamed rice that continue to gently 'cook' the eggs. Each velvety mouthful yield a depth of flavours that is just exquisite. For excellent results, use the best quality chicken and eggs that you can get your hands on. These are, after all, the stars of the dish. In a bowl, combined the Dashi or stock, sake, sugar, mirin and soy sauce and mix well. In a separate bowl, lightly beat the eggs. Put the hot rice into individual donburi or a medium size bowls. 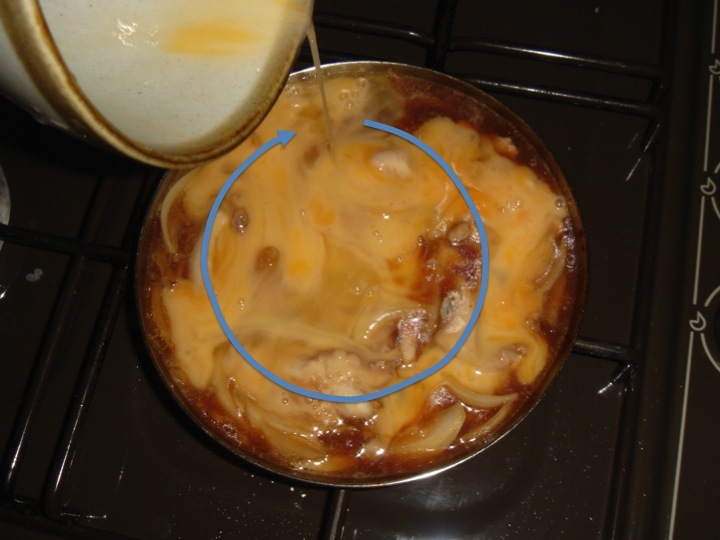 Pour half of the Dashi mixture into an oyako-nabe pan or a small frying pan and bring to the boil over a medium heat. Add half the chicken thigh pieces and onion slices and simmer for 2-3 minutes, until the chicken is cooked through and the onion has soften. Pour in half the amount of beaten eggs gently along the edge of the pan in a circular motion. Cover and simmer for about 30 seconds while shaking the pan gently. The eggs should just starting to set but still slightly runny in the middle. Turn off the heat and slide everything onto the rice in one of the donburi bowls. The remaining heat from the rice will continue to cook the eggs. Repeat this process for the other portion. Serves garnished with nori strips .